Some Camellias such asCamellia edithae are not widely found in nurseries, yet they are very important in the production of modern hybrids. Camellia edithae is one of those species that has been used widely for breeding, lots of crosses, cultivars and forms, you name it. The usefulness of the species is that it is a smaller growing form or compact. Used in hybridisation is that it gives some of these qualities to plants where it used as a parent. It also has very attractive foliage, compact growth and fairly upright in habit. A double ‘deep red’ form with the “Momudan” is in the botanical gardens in Melbourne, formal pink form “Jiuqui” can also be found here. Perhaps the best know is C. edithae ‘Dongan Sancha’. C. edithae ‘Dongan Sancha’ has soft foliage with distinct hairs. Foliage is a mid green rather than deep and the red flowers do contrast well against it. Some of these are available if you happen to be member of one of the Camellia Societies in Australia, a good reason to be involved in garden clubs. C. edithae requires similar conditions to other species. Filtered light and a humus rich slightly acidic soil. 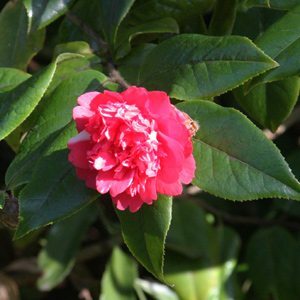 Mulch around the plant to maintain a cool root run, and use a specialist Camellia fertiliser each spring. It does have slow growth and will not require much pruning at all. Once established it should flower reliably. Position – Morning sun, dappled shade in the afternoon. Soil – Humus rich well drained with some moisture. Height – Will reach 1 to 2 metres in height. Foliage – Mid to light green. Flowers – Light bright red. Flowering period – Winter to spring.